^ Henson, Mike. Jenson Button wins dramatic Australian Grand Prix. BBC Sport (BBC). 2010-03-28 [2010-03-29]. ^ Qantas is Aussie GP naming-rights backer. speedcafe.com.au (SpeedCafe). 2010-02-24 [2010-02-24]. （原始内容存档于2010-02-27）. ^ Legard, Jonathan. Virgin forced into redesign by fuel tank blunder. BBC Sport (BBC). 2010-03-26 [2010-03-26]. ^ Cary, Tom; Hough, Andrew. Lewis Hamilton: Formula 1 driver's Mercedes impounded by police in Melbourne. The Daily Telegraph (Telegraph Media Group). 2010-03-26 [2010-03-28]. ^ Cary, Tom; Hough, Andrew. Lewis Hamilton: Formula 1 driver stopped by Australian police for 'reckless driving'. The Daily Telegraph (Telegraph Media Group). 2010-03-27 [2010-03-28]. ^ Noble, Jonathan. Di Resta ready for Formula 1 chance. autosport.com (Haymarket Publications). 2010-03-24 [2010-03-26]. 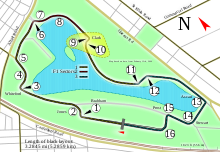 ^ Malaysian Grand Prix Preview. PlanetF1.com (365 Media Group Ltd.). 2010-04-01 [2010-04-01]. （原始内容存档于2010-04-04）. ^ Noble, Jonathan. Webber reprimanded for Hamilton clash. autosport.com (Haymarket Publications). 2010-03-28 [2010-03-29]. ^ Sunday team quotes. grandprix.com. 2010-03-28 [2010-03-28]. ^ Noble, Jonathan. Pitlane start for Virgin drivers. Autosport.com (Haymarket Publications). 2010-03-28 [2010-03-28].